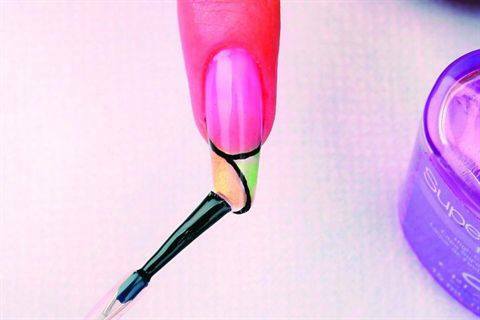 Check out these step-by-step nail art designs with international appeal. 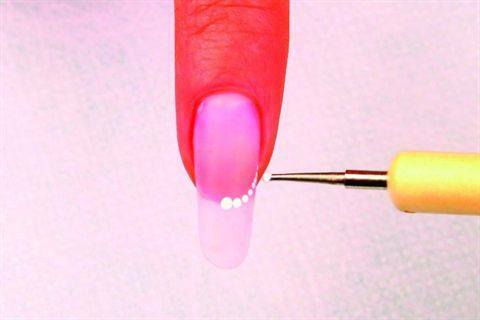 They were created by students at the award-winning Russian School of Nail Enhancement OleHouse in Moscow. 1. Apply a form to the prepped nail. 2. Create the perfect acrylic color (according to skin and nail color) using CND’s Custom Blended Manicure kit. Apply it to the nail, stopping at the free edge. 3. 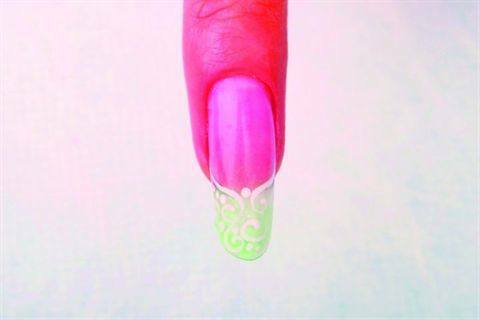 Create the free edge with CND Perfect Clear Acrylic. 4. 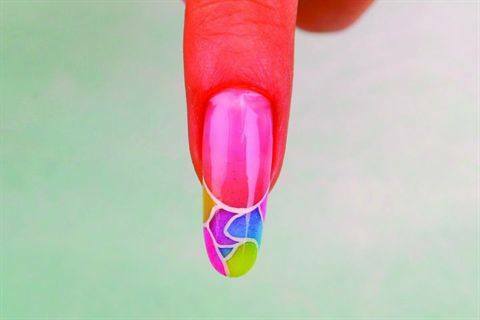 Using different colors from the Custom Blended Manicure kit, create a mosaic design as shown. 5. Apply Perfect Clear Acrylic onto the entire nail plate. 7. Accentuate the smile line and the border of each color with white paint. 8. Seal the pattern with top coat. 1. Use a stylus tool and white acrylic paint to make dots of different sizes on the free edge, starting at the smile line. Apply top coat. 2. 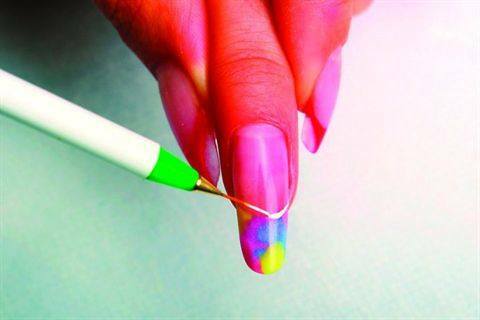 Cover the underside of the nail with colorful polish of the client’s choice. 3. Show the client the finished nail. 1. Use a stylus tool and white acrylic paint to create dots and swirls. Apply top coat. 2. 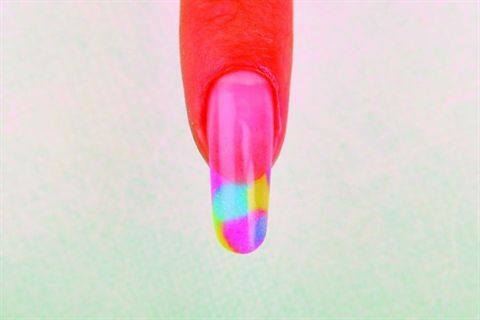 On the underside, apply colorful polish (in a color that matches or complements the wedding dress) to the free edge. 1. Use a stylus tool and white acrylic paint to make dots of different sizes along the smile line. 2. On the underside, apply spots of polish in yellow, black, and silver. 3. Finish by flipping the nail back over to the original side and adding a line of small black acrylic paint dots over the white dots. 1. 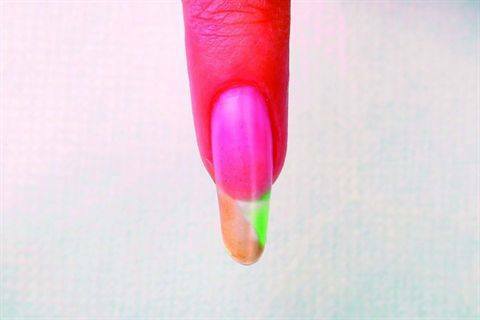 On the underside of the nail, apply gold and pale green polish to the free edge. 2. With black acrylic paint, trace the smile line and the border between the colors. Apply top coat.